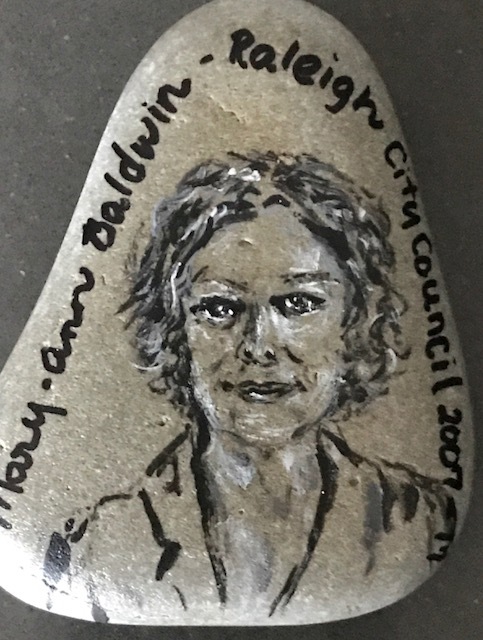 Mary-Ann Baldwin, a polarizing figure on the Raleigh City Council who has been supportive of new development near N.C. State University and drew criticism for posting a picture on social media of her dog urinating on a column at the General Assembly, will not seek re-election this fall. It strikes me that this summary falls far short in capsulizing her decade of innovative and responsive leadership in Raleigh. I came to Raleigh after living in Tokyo and London. I had a lot of ideas, but experience in public art? Coming from huge cities, not so much. Yet in this small city weighed down by recession when we arrived, I saw possibility in the buildings that were sitting empty. What if we considered them canvases for public art? The question was, would anyone else join me in asking, What if? What if people of all ages and levels of experience could help shape our streetscapes and literally lend their lines and colors to our downtown? The answer was Mary-Ann Baldwin. The morning I made my pitch to the board of Triangle Transit to paint a 150 foot mural on the Dillon Supply building on the south end of West Street, I sat over coffee with Mary-Ann, who spent the rest of the morning twisting arms so that by the time I arrived, I saw only smiles. And that was just the beginning. It was people like Mary-Ann who fed my desire to keep going. My focus has always been on the function art serves in our lives as a means to connecting people and allowing them to see themselves as creatively empowered. This is pretty much the opposite pole from traditional public art that depends on major corporate donors, a pedigree of successful projects and a profit loss statement that goes back for years. Yet whether it was supporting our Glenwood South neighborhood’s knitting of 150 tree sweaters, or encouraging crosswalk art, Mary-Ann was the person from the city who said, YES! Let’s make this work! And in every case, she was willing to follow up on a personal level to help streamline the process for me. I thank Mary-Ann for her championing of individuals and small businesses who ask What if? To respond as she has constantly responded – balancing good sense with fostering pure potential, she has touched my life, as well as all those who bring innovative, grassroots vision to Raleigh. She will be sorely missed, but never forgotten. The Glenwood South Neighborhood Collaborative was formed nearly four years ago to provide a platform facilitating residents and merchants working together to pursue projects and initiatives designed to foster growth and connection within the neighborhood. By tapping into the strength of this high density residential and commercial district, the GSNC’s mission was to maximize the vitality and appeal of Glenwood South for both residents and visitors. From the beginning, there was no shortage of ideas of what might be accomplished, but many proposals that popped up had not been tried elsewhere in the city. Clearly, the neighborhood needed a champion on City Council; someone who could both appreciate the benefits of what the GSNC was banding together to do as a community, and someone who could just as critically, help to guide the neighborhood through the city rules and ordinances that inevitably arose. Following the success of public art projects (Tree Sweaters, Scarf Trees, Crosswalk Art), Glenwood South naturally looked again to neighborhood champion … Mary-Ann Baldwin. Thanks to Mary-Ann’s involvement three years ago, the neighborhood was able to get daytime parking restrictions lifted along sections of Glenwood Avenue as a means to improving walkability by slowing down commuter traffic, as well as opening up new customer parking places for local businesses. Then two years ago, with Mary-Ann’s support the City Council created a new ordinance that established the Glenwood South Hospitality District, allowing the neighborhood to better manage noise disturbances by providing clarity on late night outdoor music noise levels, and the adoption of a new approach to encouraging communication between residents and business owners to resolve conflicts. And finally, this year Glenwood South will be a brighter place over the holidays thanks to Mary-Ann, who led the way for the neighborhood to get the financial support needed from the DRA and others to provide holiday lights and banners along Glenwood Avenue. Glenwood South and DRA will be featuring this stone as part of their Glenwood South Rocks project on September First Friday. There’s an energy in cities where neighborhoods are empowered to create public art and consider new ideas for bringing together community. This runs in the face of how cities are commonly governed to avoid precedent-setting activities that garner risk and the possibility of problems down the road. It takes leadership like Mary-Ann’s that slices through the resistance that keeps everyone in their lanes. 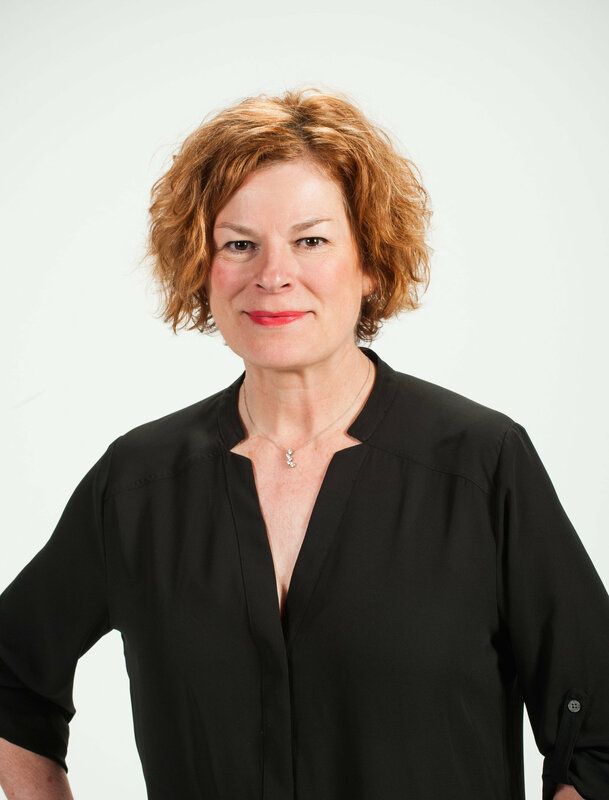 Thanks to her, Glenwood South is thriving and well and continuing to consider ideas for residents and merchants working together to create the downtown community of which they dream. Thanks, Mary-Ann for your support in getting us launched. The GSNC looks forward to the continuing creativity and responsiveness that is sure to follow in your footsteps. 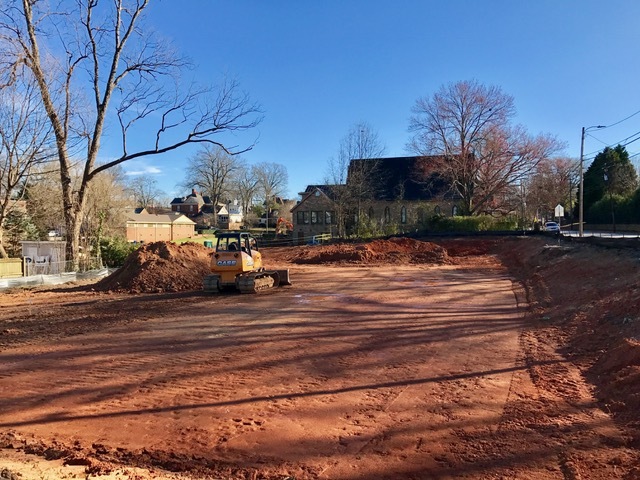 As an investor in Glenwood South since 1995 when he bought his first house on North Street, Souheil Al Awar has long been fascinated with the palette of warehouses, trees and bungalows that defines this unique neighborhood. 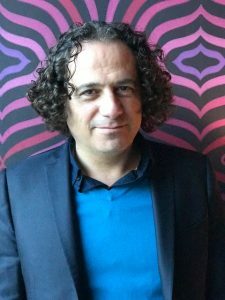 With vision broadened by his experiences moving from Beirut to Dubai, to Venezuela (he now lives in Raleigh and Montreal) – and fine-tuned by his background at NCSU’s College of Design – it’s not surprising that Al Awar shoulders his appreciation for what has been with a vision for what might come next. Enter The Saint. Why, “The Saint”? It’s a nod to the address (between Lane and Jones) on St. Mary’s, a street he sees as one where people have traditionally been attracted by the many trees and beautiful homes. But his focus is on a new generation of downtowners: people who have been living in small condos or apartments, who now want more space to raise growing families or perhaps have enough bedrooms for tucking in grandchildren. In keeping with Al Awar’s unique mixture of respect for the history of this area and a love for quality and forward looking style, the 17 four-story townhomes, (with elevators accessed from 2-car garages) will be constructed of glazed black bricks reminiscent of NC pottery and vertically placed cypress wood paneling, with oversized windows and master suites with 12 foot ceilings. Each of the nine floor plans ranging from the mid $900,000’s (2700 sq ft) to $1.7 million (4,200 sq ft) will also include roof top gardens. In spite of the multi-floored designs, it was important to Al Awar not to exceed the height of the neighboring church. It is his desire to fit into the neighborhood, while providing a custom built alternative to the many apartments now being constructed in downtown. This dream has been a long time coming for Al Awar and the neighborhood. He first started the permitting process for these townhomes back in 2013. But the infrastructure is now in place and the first unit will be ready by late fall. This owner of Clockwork offers us a perfect model for honoring both the past, while also exciting us about the next phase. By presenting this new option in scale and quality, he leaps into a new concept for downtown living sure to make Raleigh a destination for families and professionals seeking spacious living in an urban setting. John Kane has just bought another swath of land on the northeast side of Glenwood South. 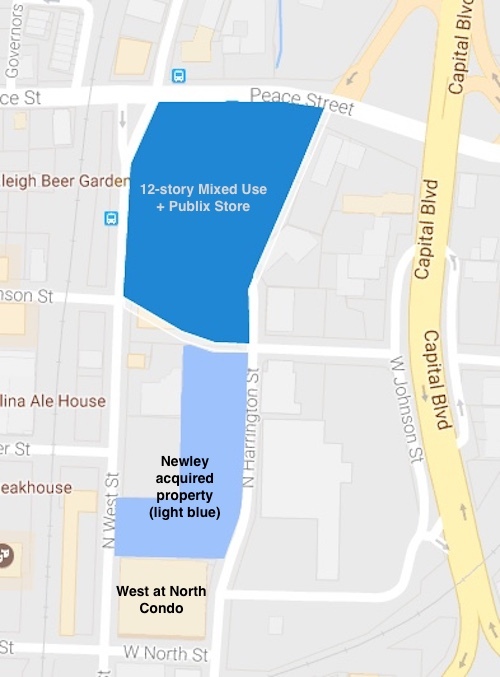 The new property is located behind his proposed 12-story mixed use building at the corner of Peace and West Streets, previously owned by Gregg Sandreuter. Gregg was the developer of the North at West condos, and had filed plans several years ago to build two apartment buildings on this site (West Apartments I & II). Let’s hope Kane has plans for something bigger and better … downtown has enough 6 story apartment buildings. And this Triangle Business Journal article says that Kane is “close to a deal with Public Super Markets” to become the anchor store for his property at the corner of Peace and West Streets. The map below shows the location of Kane’s current property, and most recent purchase. 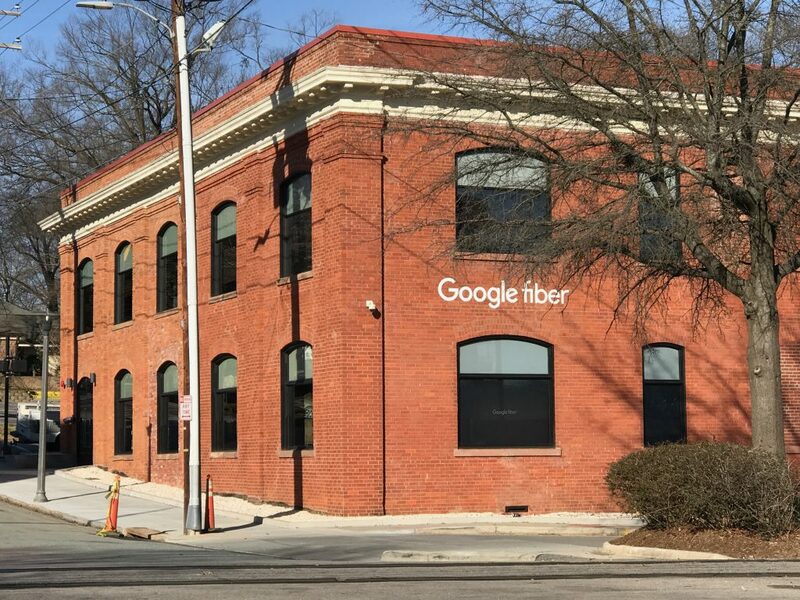 Your neighbors at Google Fiber are excited to swing open their doors to Triangle residents at their brand new Raleigh Fiber Space, here on Glenwood South in the historic 518 West Jones building. They hope you’ll come by to take Google Fiber’s superfast Gigabit Internet and TV for a spin. The space will be open starting today and will be open Monday through Saturday, 10am to 7pm. The opening coincides with Google Fiber opening sign-ups for residents and businesses in the North Hills, midtown area of Raleigh. The Fiber Space is designed to serve as both a place to experience Google Fiber and a place for our community to gather. They plan to have lots of events and even invite nonprofit and community groups to reserve the space for meetings and gatherings. You can find out more here. Finally, they hope you’ll stop in on Wednesday, February 1, from noon to 8 p.m. for a community open house and again this Friday, February 3 for First Friday. In celebration of Raleigh’s local artist community and to kick off Black History Month, they are unveiling the latest addition to Raleigh’s mural scene, created by Victor Knight, III, as well as some of his other works. Providing beats for the evening will be local legend, 9th Wonder.